Inclusive design has traditionally dealt with physical design and differences in age and ability. However, as information technology becomes more pervasive, the new barriers to inclusivity are increasingly digital. Centring design around people can increase competitiveness and value, especially in fast-moving technology markets, but technology-specific, people-centred strategies need to be developed that build on existing inclusive design processes and go beyond the ’technology-push needs-pull’ approach to accommodate the social complexity that surrounds the everyday use of technology. 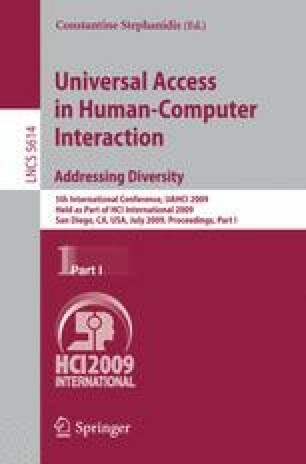 This paper focuses on the challenges of implementing inclusive design in an technology context, illustrating this with examples drawn from the Royal College of Art Helen Hamlyn Centre (HHC). It outlines work done with students within an educational context and projects completed by design graduates working with industry. The case studies aim to demonstrate an approach that brings together the user’s voice and the designer’s creativity to enable a more inclusive approach.